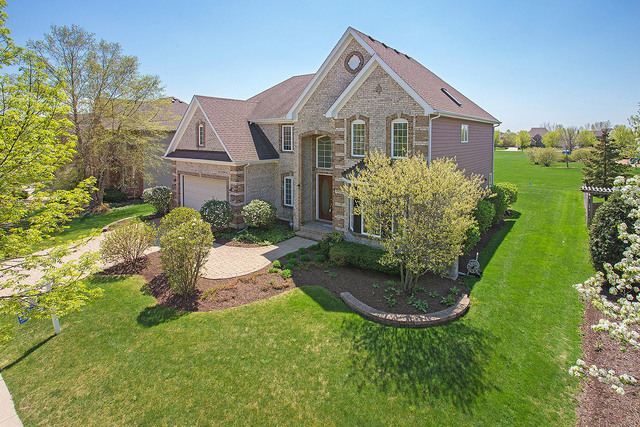 Beautiful custom home backs to open green space and park in sought after South Pointe. Light and bright open floor plan with soaring ceilings and oversize windows. 4 spacious bedrooms, and 3 1/2 baths. 3 FULL baths on second floor includes a jack and jill bath and a private ensuite. Gourmet kitchen with maple cabinets, Corian counters & stainless steel appliances. Large living and dining rooms for entertaining. Impressive 2 story family room with a wall of windows and dramatic corner fireplace with decorative surround. Luxurious master suite with sitting area, amazing his/her walk-in closet, spa-like bath with a whirlpool tub and separate shower. Glorious sunroom overlooks the park like backyard. Expansive room sizes throughout home. First floor laundry room. Brick paver driveway and walkway, 3 car tandem garage extra deep for storage. Brick paver patio overlooks the green open space. Pool community-pool bond included. Ideal location near dining, shopping, schools, parks and I-55.